Spearmint (mentha spicata) - Most widely used mint for culinary and tea purposes. 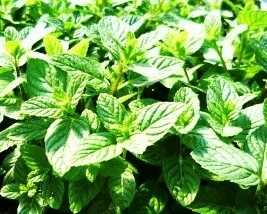 Elongated green leaves have a wonderful spearmint scent and flavor. Easy to grow perennial zones 4-9. Live starter plant in 3 inch container. That‘s spearmint. Relatively strong spearmint scent and flavor. Grows great.